Necklace measures approximately 18-5/8" inside circumference, allowing the side links to measure approximately 1-5/8" long (excluding side rings) and 1-3/8" at widest point, and the center link measures approximately 2-3/8" long and 2-1/4" at widest point. Hook dangle earrings measure approximately 1-7/8" long and 5/8" at widest point. The necklace weighs 56 grams. An offer like this will not last long! 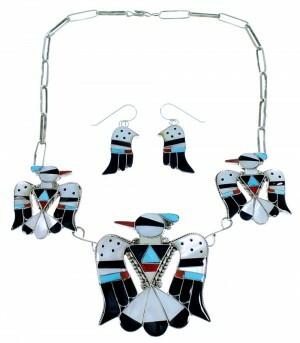 This piece of Native American jewelry is Zuni hand crafted by artists Bobby and Corrine Shack, out of genuine sterling silver and real Multicolor inlay. The inlay consisits of: Turquoise, Coral, Jet, Brown Shell, and Mother of Pearl. 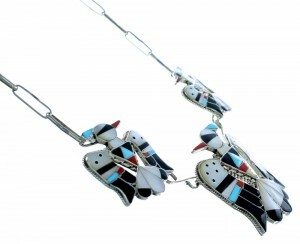 The inlay is carefully set, creating striking Thunderbird designs. A total of THREE Thunderbirds make up the necklace, while twisted silver and mini silver beads can be seen accenting for a fantastic look. 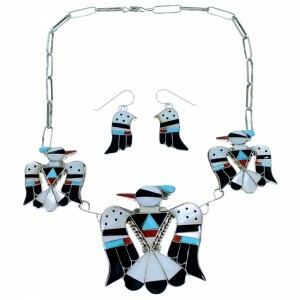 The necklace is stamped Zuni, sterling, and hallmarked by the artist. 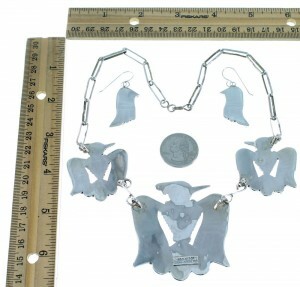 The earrings have a total of TWO Thunderbird wings that perfectly match the necklace for a wonderful finish.